As SLASH FEATURING MYLES KENNEDY AND THE CONSPIRATORS --Slash (guitars), Myles Kennedy (lead vocals), Todd Kerns (bass), Brent Fitz (drums) and Frank Sidoris (rhythm guitar) are currently on their worldwide tour through Asia, New Zealand, Australia, Europe and the U.K., the group has announced they’ll kick off a headlining U.S. tour this summer. The U.S. trek will launch on July 15 in San Francisco and wrap-up August 13 in Orlando. Tickets will go on-sale this Friday, February 8 at 10AM local time and are available at http://www.slashonline.com. The iconic, GRAMMY-winning guitarist SLASH and his band, SLASH FEATURING MYLES KENNEDY AND THE CONSPIRATORS are touring worldwide in support of their third album LIVING THE DREAM and will release the new single “Mind Your Manners”--which Rolling Stone hailed “a menacing blues-rocker”--to radio starting February 4. The song--which already debuted at #39 ahead of its official radio impact date--follows the first single “Driving Rain”--Slash’s fastest rising single to date—which recently became the band’s 5th Top 5 hit in a row at Rock Radio. LIVING THE DREAM (Snakepit Records/RoadRunner Records) is the third full-length offering from SLASH FEATURING MYLES KENNEDY AND THE CONSPIRATORS. The Los Angeles Times described the album as, “his best work since the demise of VELVET REVOLVER. …full of “unexpected funk, boogie, blues and garage rock influences.” While Rolling Stone declared the album, “a biting blues filigree at the end of a riff, weeping solos full of long notes, boogie-woogie riffs.” Elsewhere, Classic Rock hailed, “the bands third and Best Album, "The Great Pretender" is the album’s masterpiece and one of the best things Slash has ever done.” Fueled by the Top 5 rock song “Driving Rain”, its live-action, animated video as well as the best critical acclaim of their career, LIVING THE DREAM debuted with 10, Top 10 chart placements around the world. The first single “Driving Rain” which jumped to the Top #5--marks the band’s 6th consecutive, Top 10 single at radio and Slash’s fastest-rising single ever in his solo career. 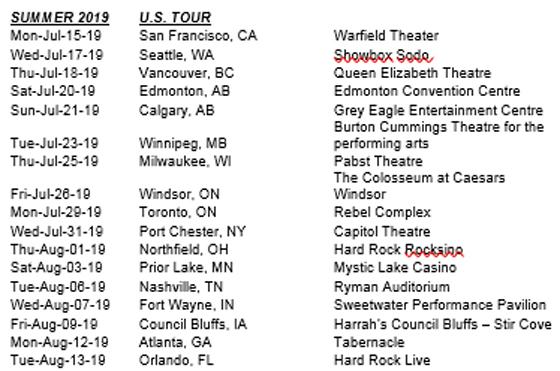 Catch SLASH FEATURING MYLES KENNEDY AND THE CONSPIRATORS on the LIVING THE DREAM WORLD TOUR 2019. Expect more U.S. dates to be announced soon.